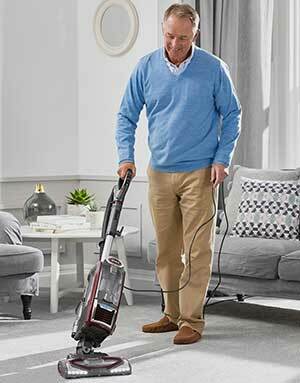 I’ve finally made it through all the different categories of vacuum cleaners that I feel confident in bringing you this guide on the very best vacuum cleaners in the UK. I’ve split it into different categories so you can still find the specific one you need and get your house cleaned they way you want! But first let’s take a look at a quick summary of the best vacuums before I get into what you need in a vacuum cleaner and what you want to look for. Vacuuming isn’t the most fun task to have to do so you want to be comfortable while you do it. Now the main difference in comfort is between upright vacuums and cylinder vacuums. Upright Vacuums are better if you don’t mind a bit of extra weight and don’t want to have to keep bending down. Or you don’t like dragging the vacuum behind you and hitting it off doorways and tipping it over. Cylinder Vacuums on the other hand are lightweight so they’re easy to whizz round with and usually a lot easier to put away in the cupboard after you’re done. Is there a difference in cleaning power? There is a bit, if you have pets then go for an upright because it has that bit of extra suction you need to deal with pet hair. Otherwise for most normal households either is fine. But if you feel you need some extra cleaning power then go for the upright. It used to be that the more watts a vacuum had the more powerful it was. So an 1800w vacuum would be twice as powerful as a 900w but the EU changed that. Now vacuums can’t be over 1000w so manufacturers had to keep up suction power while keeping power consumption down. Now, most vacuums are all powerful enough for the home. There are special circumstances, such as pets where you’ll need better suction. Or if lots of people in the house have long hair. But for Pets or Long Hair just get a model designed for pets and you’ll be fine. They normally have the word pets in the title. Cordless Vacuums are the future. Companies like Dyson are moving towards only making cordless vacuums so they’ve come a really long way in terms of quality. Great suction, easy to maneuver and they last well. It used to be that cordless vacuums would only last a few years but now batteries are always improving and they just keep getting better. Do You Want To Keep Buying Bags? That’s the main difference between bagged and bagless vacuums. The actual suction and general use don’t change. It’s just that Bagged vacuums are easier to empty but you have to keep buying bags. I’m on the side of bagless because it’s one less thing that has to sit in a landfill somewhere. The Dyson V6 is a great little vacuum cleaner. You can charge it up in just 3.5 hours and it runs for 40 minutes! Perfect for quick clean ups. Not ideal if you like doing the whole house once a week or every two weeks but fantastic if you like to clean room by room through out the week. I personally like to look in the living room give it a tidy then vacuum. You can empty it really easily and it wall mounts so doesn’t take up much space in the cupboard between uses. It charges in the mount as well but you don’t have to use it, it does charge away from that if you want it too! Overall it was a close call but Dyson are an excellent choice for the best cordless vacuum in the UK. I promise this isn’t just going to be a Dyson fest ut the DC41 is an excellent vacuum for pet hair it can’t be denied! You just can’t beat a Dyson for unadulterated cleaning power. It’s also got a lot of handy time savers, the ball head lets you steer easier so you’re not just going back and forth over the same spots again and again. And it’s got an adjustable head so that when you roll from carpet to hard floor it auto-adjusts so you don’t have to flick switches or change heads. The dust container isn’t the biggest so you have to empty it fairly regularly, this just makes sure it stays at maximum power for longer. What about the pet hair? It will make short work of it! Even in carpets where long hair can tend to get stuck, it’ll be rid of it no problem. 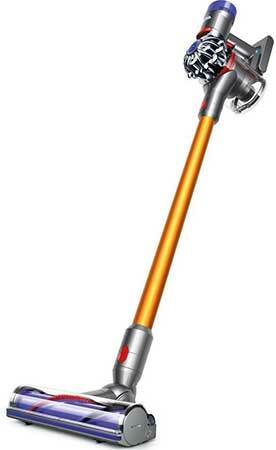 Shark make some top quality vacuum cleaners, definitely up there alongside Dyson in terms of build quality and cleaning power with the advantage of being a little cheaper! What’s cool about this model is you can lift the body away from the main unit and use the hose to get in about hard to reach areas. So you can clean the stairs up in corners of the ceiling and in about the kitchen really easily. It’s also quite minimalist so doesn’t way too much for an upright vacuum and it’s got LED lights on the base so you can see right under furniture to make sure you’ve cleaned properly! A great vacuum for carpet, hard floor and any size of house. 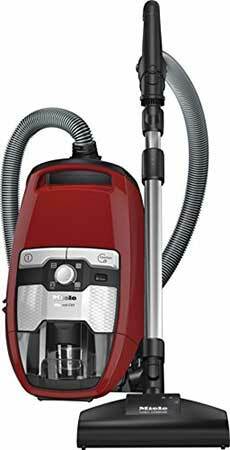 Miele are the best at Cylinder Vacuums, all their cylinder vacuums are super powerfull and nice and compact, but the best of the best has to be the Blizzard CX1. Well built and made to last the Miele picks up dirt from carpet and ard floor effortlessly. It’s easy to empty with a one-click release system and just generally super easy to use! It’s nice and lightweight so it really just glides around behind you, definitely doesn’t need to be dragged like some cylinder vacuums do! All in all, a superb vacuum cleaner! I’ve also reviewed more of the Miele Vacuums for those who are interested. If you’re looking for more cylinder vacuum reviews just click here. Here are a couple of other review pages that didn’t quite fit in above.